Robbery involves taking property by force. Robbery is often associated with a man in a black eye mask holding bags of cash and a gun running from the police, but make no mistake, they are very serious criminal charges for which it would be a very good idea to retain a Utah robbery lawyer. Robbery involves the unlawful and intentional taking of personal property from the possession of another who has possession of the property on his person or in his immediate presence by force with the intention to permanently deprive the person of the property. 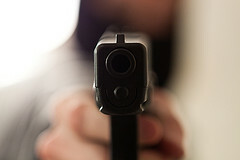 Force or fear of the use of immediate force must be used by the perpetrator to commit a robbery. Thus, the typical mugging is a robbery. Likewise, stickups and hold ups at banks and convenience stores are robberies. Robbery is a second degree felony because it is a property crime which involves violence. That means that prison time, fines, and restitution all become possible penalties for he who is convicted of the offense, so minimizing those potential penalties is what a good Utah robbery lawyer will do for you. There are three ways that a robbery becomes an aggravated robbery. First, if the suspect used a dangerous weapon which is defined as anything that can cause death or serious bodily injury. We have seen prosecutors claim that a skateboard which was used as a weapon was a “dangerous weapon,” so basically, anything can be claimed to be a dangerous weapon for purposes of an aggravated robbery charge. Second, if the suspect actually caused serious bodily injury. Finally if the suspect stole or attempted to steal a motor vehicle. If any of these acts are committed during the course of a robbery the charges will be enhanced to an aggravated robbery. Aggravated robbery is a first degree felony which can result in life in prison. If you have been charged with aggravated robbery our experienced Criminal Defense law firm to get top rated attorneys defending your rights. Call us anytime for a consultation at 801.413.1753.